Academics are not particularly well known for nailing their political colours to the mast, preferring instead the relatively quiet (and often privileged) life of ivory towers, the occasional lecture and publication of learned but often obscure papers and books. Bill Bowring is, therefore, a rare breed. He is at the same time a leading academic, a human rights lawyer and a political activist. Bowring has the honour, for example, of having been thrown out of Putin’s Russia twice, undoubtedly because of his championing of the rights of the Chechen people in the courts. Bowring is also openly a Marxist who wages philosophical battle against postmodern relativism and subjectivism in the field of international law and human rights. For example, he takes issue with Adam Gearey’s book, Globalization and Law. Bowring points out that this book does not mention the possible existence of a system in the chapter that deals with the International Monetary Fund and the World Trade Organisation. Gearey simply makes do with the concept of “power relationships”. The reluctance to use the term “capitalism” may have been determined by the apparent evolution of the system into a new “paradigm”, where the old rules no longer applied. Unfortunately for Geary and others, the financial crash has rather proved him wrong and even the bourgeois media openly talks of a capitalist system in crisis. Bowring’s consistent materialist approach is that international law and human rights are rooted in and appear as a result of people taking part in social struggles and revolutions. In that sense, they are the results of class struggle through the centuries whereby the state at national and international level has been compelled to accept and adopt certain norms and rules. The fact that these same laws have been largely discarded in recent years only indicates that the struggles that produced them in the first place have to be renewed in a fresh setting. The author, who is professor of law at Birkbeck College, University of London has developed his thinking around the concept of three generations of rights which he associates with distinct periods of social upheaval – the French Revolution of 1789, the Russian Revolution of 1917 and the national liberation, anti-colonial struggles that took place between 1945 and the 1960s. These events helped shape democratic rights, social and economic rights and the right to self-determination which eventually became embodied in international law and practice. Bowring’s book is an important addition to our knowledge about rights. It is unfortunate, however, that the author uses the term “communism” to refer to the former Soviet Union and also paints a fairly rosy picture of that country’s support for national liberation and self-determination struggles. Using the term “communism” lends credence to the capitalist ideologues who insist that the demise of the USSR was the “collapse of communism”, when it was something quite different. As the author knows because he participated in the perestroika and glasnost period when Mikhail Gorbachev tried to carry through a political revolution, the last Soviet leader was up against a Stalinist bureaucracy desperate to hold on to the privileges and power it had usurped from the people from the late 1920s. Of course, the Stalinist bureaucracy defended the state property relations established by the 1917 October Revolution – but at a price that included the Nazi-Soviet pact (making World War II inevitable) and a duplicitous role in national liberation struggles in the post-war period, when movements often became pawns in a struggle between the USSR and the USA. While, for example, Moscow supported some self-determination struggles they also backed plots and intrigues against the Palestinian leadership of Yasser Arafat and suppressed self-determination in Eastern Europe. Eventually, the bureaucracy’s last act was to engineer a coup against Gorbachev that precipitated the fall of the Soviet Union itself. This is an extremely important book in that it demonstrates clearly the relationship of human rights and international law to the struggles of real human beings. 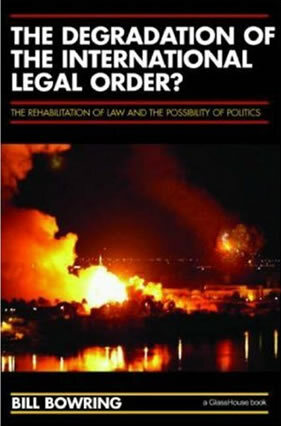 The sub-title of the book is The Rehabilitation of Law and the Possibility of Politics. Here the author insists that “international law contains within its principles and concepts the content of world-shaking movements, a content that is capable, sometimes, unpredictably, of reappearing with a terrible vengeance”. This is, of course, true and without such spontaneous movements there would be no possibility of change. Of course, the epochal events that the book refers to were organised around leaders and parties which had strategic, revolutionary objectives. It became possible to achieve these objectives when the old order could no longer contain the contradictions that had built up within society and the existing state. The question that is posed today is how do we actually “rehabilitate law”? Can this be done within the context of the existing capitalist state framework, at national and international level? Can “we reclaim the UN”, as the author suggests we should, by piling on the pressure in London and Washington? The answer, in my view, is no. As Unmasking the State recently published by A World to Win argues, the degeneration of the capitalist state has reached a point of no return and the essential end of bourgeois democracy. The lawlessness that Bowring brings out in some detail is, in fact, related to a profound crisis of the capitalist state. This crisis in turn has its source in the contradictions within capitalist globalisation which, as we know, is in a crash greater than that of the 1929 collapse. A movement of people for rights provoked by financial collapse has started, manifesting itself in the historic victory for Barack Obama in the United States, for example. The possibility of politics has to lead to a new epoch in human relations, beyond capitalism and the capitalist state in order to restore and extend the principles of international law and human rights. The Degradation of the International Legal Order? by Bill Bowring. Routledge-Cavendish, £30.